There are many sleepless nights for parents with young infants for a variety of reasons. The baby might have excessive gas, colic, or just feeling fussy. No parent enjoys seeing there child cry or be in pain. Gerber Good Start Soothe Infant formula is constructed to soothe infants along with providing them all the nutrients and as many probiotics as possible. This formula has been given the Amazon Choice badge, this means that this is considered one of the best quality products for one of the best prices. Hopefully after this review today you will be able to decide for yourself if this the right formula for your child. Gerber has been a brand that I recognized from all the commercials when I was young. I knew it was a well known and well respected brand. However, I didn't really know much about their soothe formula. So after I did a little research and looked into the product a little bit I was very impressed, Gerber is on the cutting edge of infants health having a formula that is more closely modeled after breast milk than others. Realizing that no formula will ever be a substitute for breast milk I liked what I saw about this product. My first thoughts of Gerber Good Start Soothe infant formula were good, now let's take a look at what makes up this product. There a lot of different vitamins, prebiotics, and proteins that infants need to develop properly. At such an important stage of growth in their development these are necessary for good digestive function, immune support, and development of other systems in the body. 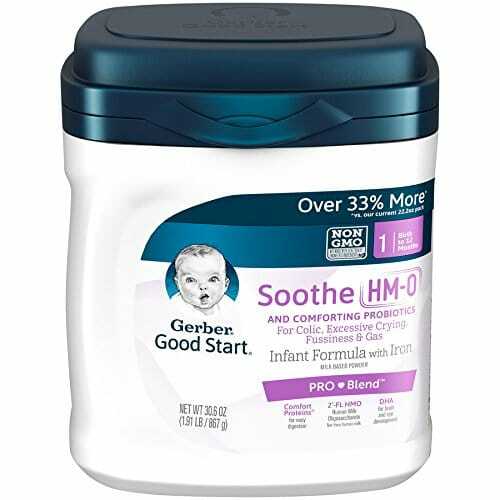 Gerber's soothe formula is a non-GMO product meaning there are no artificial growth hormones that could be potentially harmful to overall growth. Along with this they implement the use of HMO's in their formulas which we will talk about later on in the article. Let's take a look at the different ingredients that help to make up the soothe infant formula from Gerber. 2'-FL HMO stands for 2' fucosyllactose human milk oligosaccharide. In short this is one of the most common prebiotics in breast milk, it makes up 30% of all HMO's in breast milk. This HMO is also directly linked to healthy development of the immune system. It has been shown to specifically protect against infectious diseases that infants are more susceptible to. When looking for any formula make sure that it has this ingredient to help support your infants immune development. DHA is an important ingredient that helps the growth and development of the brain and eyes in infants. Those alone are reason enough to include this in the ingredients for the infant formula, but there are also other health benefits included. One of these is that with proper amounts of DHA children are much less likely to develop ADHD. It has been found in some studies that DHA deficiency is common among children diagnosed with ADHD. Along with these benefits DHA is an Omega-3 contributing to healthy heart function. It has been found that infants that were fed with a DHA supplemented formula had much lower blood pressures at age six than those who did not have a supplemented diet. This may reduce the risk of cardiovascular disease as they age. As you can see DHA is an amazing ingredient that is helpful in many different way. L. Reuteri is a common probiotic found in the human mouth and stomach. When used in formulas it has been found in multiple studies to aid in relieving infants who suffer with colic. This means a lot less crying babies keeping parents up at night. Another benefit of this probiotic, and one that parents will be thankful for, is that it has been show to prevent and cure diarrhea in babies. Overall Gerber Good Start Soothe infant formula is made with high quality ingredients meant to aid in development and overall health and comfort of the infants. Gerber Good Start Soothe Infant Formula has many great qualities and is just a great product. On Amazon out of nearly 300 reviews it has an average rating of 4.2 stars out of 5 stars, 71% of those reviews were 5 star reviews. On Gerber's website the average goes up to 4.6 out of 5, however there are fewer reviews. Most people seem to like this product and noticed good changes in their babies and they were happier overall. For those who don't know formulas are grouped for how old the infant is until they are able to begin drinking regular liquids. The Soothe formula is specifically for newborns up to 12 month old infants. Gerber Good Start Soothe Infant Formula is a well liked and proven product. It comes in a couple different sizing options on Amazon. The 22.2 ounce costs about 23 dollars and the 30.6 ounce container costs about 35 dollars. This formula is little bit more on the expensive side but works wonders with the babies. Gerber makes a promise that all milk used in their infant formulas are not from cows treated with antibiotics meaning that you are getting a clean product for your baby. Gerber started out with humble beginnings in Michigan. Dorothy Gerber began straining foods for her young daughter at the direction of her pediatrician. Her husband believed that they could much more easily do this at their canning factory. Soon different workers began asking for samples to take home for their children and thus began the Gerber baby foods company. Having been around for over 90 years they have branched into other aspects of baby health and nourishment. Because of this commitment to infant health they have participated in FITS, this is a study that began 17 years ago to better understand how infants digestive system works and the different behaviors associated with this. Gerber doesn't just stop after infancy, in fact the products they offer range from pregnancy all the way up to preschool age. Their goal and mission is to provide healthy products for mothers, infants, and children to live happy lives. This formula has a lot of pros, according to most of the reviews on Amazon people saw that their infants were happier and less gassy after using the formula. Along with happy babies it contains many different ingredients that contribute to immune system health and development, brain and eye development, and also is easily digestible. Most of the negative reviews regarding the formula had to do with their infants either not handling the formula well. This meaning that they either became more gassy or spit up more frequently. It seems as though this was a small percentage of those who used it. Another issue seen was that the formula clumped and was not easy to make smooth. After having reviewed this and researching more of the ingredients I was very impressed. Gerber has a great commitment to babies and their health, along with having healthy, happy babies you get well rested and happy parents! Although this formula is somewhat expensive it has been developed to closely resemble breast milk. No formula will ever be as good as breast milk but this works as a great supplement or substitute. The Soothe Infant Formula by Gerber's Good Start line is a high quality product with great results. It is helpful calming babies with sensitive stomachs and is proven to help relieve gas, colic, and babies are less likely to spit up after having this formula. I would recommend this to anyone looking to try out a new formula for their baby or any first time parents currently looking for the first time. If you have decided that this is a product that you would like to try for your baby take a look at it on Amazon using the link below. Here are some top questions that I found for people seriously considering buying the Gerber Good Start Soothe Powder Infant Formula. Is this for newborns only? Gerber Good Start Soothe Infant Formula is for newborns up to 12 months. How long does the formula last? If refrigerated the formula can last up to 24 hours after mixing.